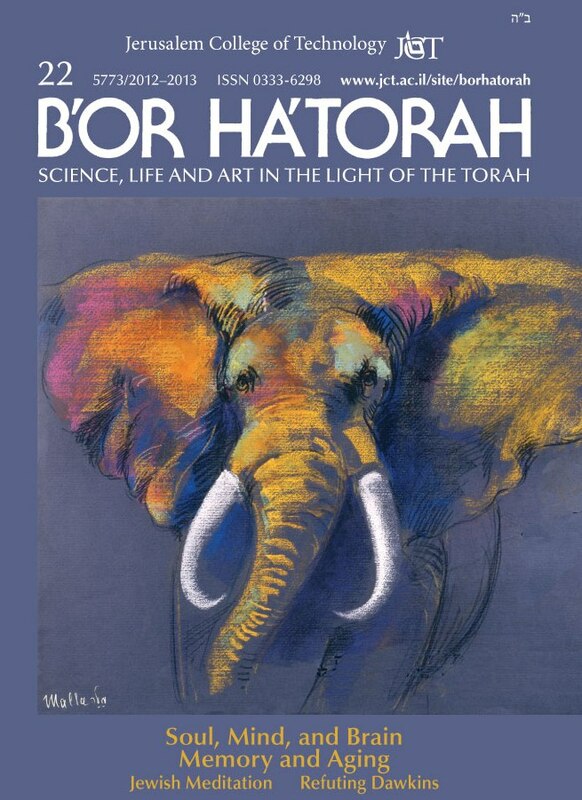 A peer-reviewed journal on the interrelationship of Judaism, science and technology, psychology, the arts, and social issues, B’Or Ha’Torah illuminates a range of topics from the cosmology and ecology of Genesis; the creation ex nihilo vs. evolution and faith vs. reason debates; the views of halakhah (Jewish law) on stem cell research and genetic engineering; and the soul-mind-brain-memory-body connection. Rabbis and religious Jews with no science background as well as professionals in all fields with no Torah background can enjoy this inspiring publication in hardcopy and digital formats. In the very beginning G-d had no one to talk with (as Jerusalem College of Technology physicist Professor Joseph S. Bodenheimer clarified for us word by word in the Genesis text), so He created nature, animals, humankind, and gave us free will and the Torah. At the Tenth Miami International Conferences on Torah held at The Shul of Bal Harbour, December 13-16, 2013, hints of that ongoing conversation were revealed. For instance, Dr. Manfred Gerstenfeld of the Jerusalem Center for Public Affairs spoke of how the dialogue between G-d and nature and the Jewish People can be found in basic concepts of modern ecology. Whereas Wesleyan cell biologist Professor Jason Wolfe explained that the mechanism of its own death is programmed into every cell, the conference presented birth as no longer an automatic process. Columbia University geneticist Dr. John Loike discussed the newest developments in technologically assisted reproduction, while Yeshiva University biologist and Rosh Yeshivah Rabbi Professor Moshe Tendler sensitively analyzed their halakhic implications, and Hebrew University bioethicist, neurologist, and Talmudic encyclopedia writer and editor Rabbi Professor Avraham Steinberg unraveled the increasing complications involved in defining fatherhood. Whether a person’s genetic make-up comes from conventional parents or surrogate or laboratory assisted sources, DNA does not totally control the development of personality. University of Miami neurologist Professor Barry Baumel demonstrated the role that the non-biological epigene plays in tipping the balance between nature and nurture. Rabbi Sholom D. Lipskar, host of the conference and as inspiring as ever, used Hasidic philosophy to confirm the potential of human behavior to overcome genetic determinism. Mayo Clinic neurologist Daniel Drubach, MD, cast light on the plasticity of the human brain to change even in the embryo. This flexibility reflects the blossoming of consciousness itself, as discussed by the Talmud Sages and interpreted by Rabbi Tzvi Freeman, author and editor of Chabad.org. With the wealth of new data supporting ancient Jewish wisdom, how can the scientists and university curricula still claim that nothing exists except the physical universe? Bar-Ilan University physicist Professor Nathan Aviezer took the materialist arguments from Spinoza to Hawking and Dawkins to task and disproved them all. With her transcendent insight, Professor of Chinese history Vera Schwarcz compared how the Jewish and Confucian traditions delineate the major passageways of life. Terminal illness is one of the unfortunate passageways of modern life. Rabbi Barry M. Kinzbrunner MD, Chief Medical Officer of the Vitas Healthcare Corporation, explained the medical and halakhic aspects of hospice care. Herzog Hospital neurologist Yakir Kaufman proposed that we integrate the Tree of Life paradigm of Kabbalah into our medical knowledge in order to understand Alzheimer’s Disease and human life in its totality. Rabbi Simon Jacobson, Dean of the Meaningful Life Center, looked deeply into the passageways of matter transforming into energy and the soul leaving the body, and concluded that life never ends. The questions themselves are also endless, and they will be explored further, in new ways, at the next conference, in 2015. The topic will be: Communication.